It was raining in New Orleans. Destiney Bell was keeping an eye on her roommate’s toddler as she monitored the rain gauge in her yard. The water was rising, and Bell knew what that meant: Her street would flood. Indeed, within an hour, the corner was submerged. Bell used her phone to snap photos of her rain gauge and the flooded street. She then uploaded them to ISeeChange — a global online platform that allows anyone with a smartphone to document climate impacts on their daily life. Bell’s observations — together with those of her neighbors and others across the country — are painting an ever-more-detailed portrait of risk and resilience in the era of climate change. With Kresge Foundation support, The Trust for Public Land (TPL) and its partner ISeeChange are finding creative ways to marry big data with the experiences of urban residents. This approach results in fine-grained, real-time information that can target adaptation efforts where they are needed most. And it uses the principles of Creative Placemaking — the integration of arts, culture and community-engaged design — to identify and address the challenges of a warming world. Climate challenges do not affect all people equally. House by house, block by block, there are huge differences in vulnerability based on geography, health status, income level and other factors. Such differences are not always visible to decision-makers. For example, when city officials assess flood risk, they typically look at average elevation and (increasingly unreliable) floodplain maps. They do not, generally, consider the view from Bell’s window. That has begun to change. In 2016, Kresge’s Environment, Health and Arts & Culture programs teamed up to improve the way New Orleans and other vulnerable cities respond to a changing climate. Together, they supported TPL’s work to pilot a holistic approach to adaptation, Creative Placemaking and developing healthy places. The collaboration with ISeeChange helped TPL and Kresge find ways in which climate and Creative Placemaking approaches could combine to deliver innovative solutions. By working across disciplines — both within the foundation and on the ground — the project is charting a climate plan that puts community needs front and center. Earlier, TPL — a national leader in creating parks and protecting green spaces — provided data and analysis to help the City of New Orleans secure a $141 million grant from the U.S. Department of Housing and Urban Development. The grant will be used to create a “resilience district” in the mixed-income Gentilly neighborhood, where Bell lives. It calls for a sizeable investment in green infrastructure — parks and green spaces that absorb stormwater, while providing places for neighbors to gather and play. These multitasking urban oases offer several climate benefits: Their shade helps cool the city and reduce energy use, while shoreline parks protect against rising seas and flooding. Trails and greenways connect residents to popular destinations and each other. The city’s first task was to decide where to build green infrastructure for maximum effect. To do this, TPL’s ClimateSmart Cities Program gathered stakeholders who possess critical pieces of data but do not always talk to one another. These included New Orleans city officials, the sewer and water authority, health groups, local nonprofits and the parks department. Together, they created a multilayered map that pinpoints vulnerable areas where poverty, aging infrastructure and high rates of disease intersect with climate-influencing factors like heat and flooding. Taken together, the data provide an extraordinarily detailed map of risk — and a blueprint for building resilience. “You make better decisions when you consider all this information together,” says Sarah Olivier, TPL’s New Orleans program director. For example, the city was considering a site for a park near an elementary school and a large public housing project. The site was already a strong candidate, but when public health data was overlaid, Olivier says the area “showed up bright red” as a hot spot for asthma and other diseases made worse by climate change — affirming the neighborhood’s urgent need for green space. But the picture was still not complete. Missing were the voices of people like Bell — those with deep ties to the neighborhood’s history and with a stake in its future. To engage those voices, TPL forged a partnership with ISeeChange, a civic media enterprise that encourages people to document climate effects in their neighborhoods by using rain gauges and heat sensors. ISeeChange uses Creative Placemaking strategies to elicit residents’ observations and stories — and to enlist them in solving the challenges they identify. That is not always easy, especially when it means long days and nights at public meetings. 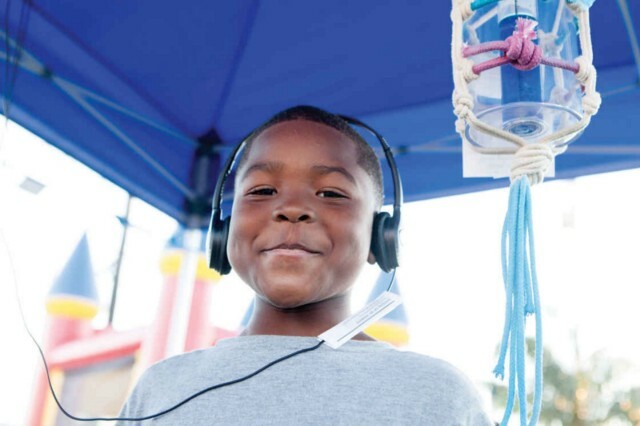 ISeeChange invited local residents to a pop-up block party that included audio stories about the past, present and future of the neighborhood. To counter that perception, Drapkin and her team got creative. To identify flood-prone areas that were not on the city’s radar, Drapkin’s team placed comment boxes inside laundromats, nail salons and restaurants. Within two weeks, the comments helped the city identify 150 previously uncharted flooding hot spots. Some of the people who submitted feedback began uploading information about those spots to the ISeeChange platform. The ISeeChange team went door to door around those hot spots recruiting citizen scientists — including Bell — to provide an onthe-ground reality check for the city’s flood maps. Bell and her neighbors also contributed stories and reminiscences, creating an archive of collective memory. As they learned more about flooding in the neighborhood, ISeeChange helped organize a “pop-up” block party with a local business owner. They decorated a board with images of flooding alongside headphones with recorded stories and an invitation to comment on the city’s green infrastructure plans. There was more. A live storytelling event, co-hosted with a local public radio producer, brought residents and decision-makers together on equal footing. And public art projects raised awareness of climate challenges — including chalked street markings and ropes that graphically depicted flooding and rising sea levels. Social scientists have long understood the value of community-generated data, but its collection is frequently neglected. “The process of working with residents is as important as the product,” says Regina Smith, managing director of Kresge’s Arts & Culture Program. “The process is a people-centric approach that puts beneficiaries at the center of decision-making. 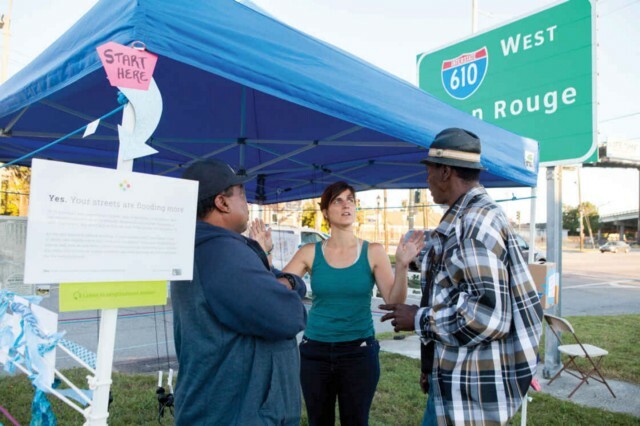 ISeeChange’s Lindsey Wagner discusses an exhibit at a pop-up block party with local residents. “This approach is not just the new ‘it’ thing; it’s becoming part of the DNA of how organizations work.” While important in its own right, the process also yields a valuable product. The information amassed — both the multilayered map created by the Climate-Smart Cities Program and the personal stories, data and observations contributed — is shaping a more resilient New Orleans. Both are included in a city request for proposals that will guide the development of green infrastructure throughout New Orleans. Because data collected by Bell and others can help better predict and prevent floods, the city will distribute another 300 gauges next year. 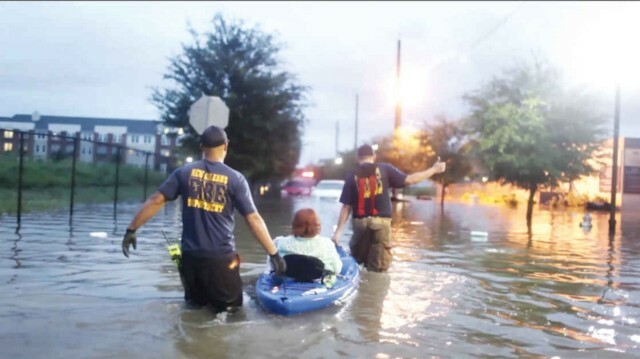 And spurred by this project’s success, both TPL and ISeeChange are launching similar projects in flood-prone communities like Norfolk, Virginia; Philadelphia, Pennsylvania; and Richmond, California. And in 2017, Kresge’s Environment Program awarded new grants that will broaden the base of New Orleans residents who understand why urban water management is important. Laurie Mazur is a consultant on population and the environment for the Wilson Center’s Environmental Change and Security Program and a writer and consultant to non-profit organizations. She is the editor, most recently, of A Pivotal Moment: Population, Justice and the Environmental Challenge (Island Press, 2009).